The plans for a Grosses Festspielhaus (Large Festival Hall), where the former archiepiscopal princely stables were located, were drawn up primarily by the architect Clemens Holzmeister; Herbert von Karajan also made many suggestions for the building project, in particular regarding the design of the theatre hall. Every effort was made and no expense spared so as to “insert” between the three-centuries-old façade of the former court stables and the Mönchsberg a theatre with an opera stage whose structure and technical equipment would still meet highest international demands after fifty years. Between autumn 1956 and the early summer of 1960, 55,000 cubic metres of rock were blasted away to create the relevant space. The building was largely financed from the state budget and as a result the Republic of Austria is the owner of the Grosses Festspielhaus. 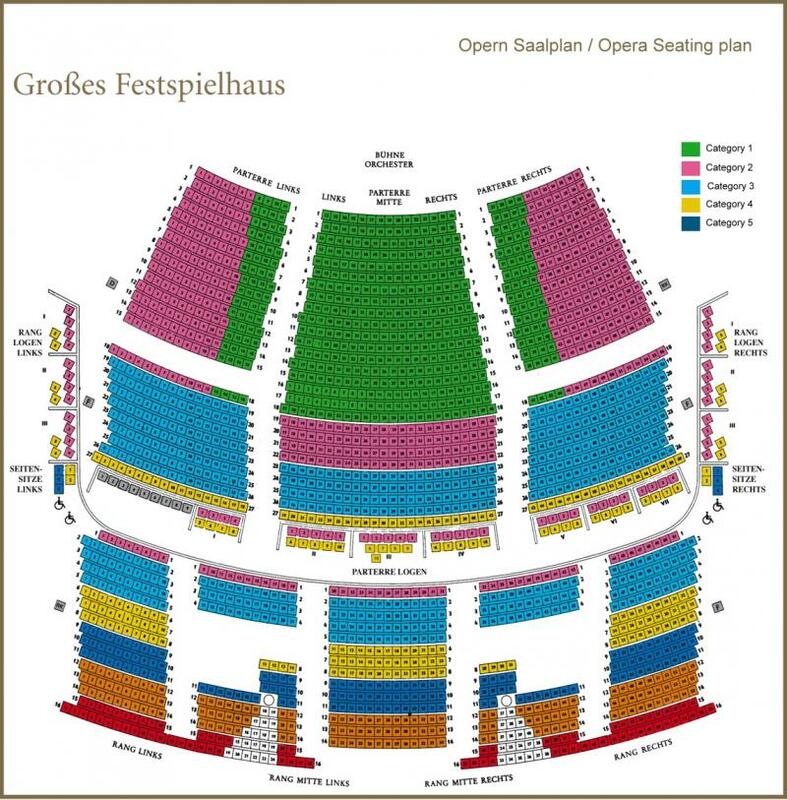 The Grosses Festspielhaus was opened on 26 July 1960 with a festive ceremony and the performance of Der Rosenkavalier by Richard Strauss conducted by Herbert von Karajan. Even though the new stage was undoubtedly impressive in its dimensions, voices were raised even then expressing regret that it would hardly be suitable for staging operas by Mozart which require a more intimate setting. The ground plan of the auditorium is almost square, nearly 35 metres long and from the stalls as well as from the circle offers ideal acoustic conditions and sight-lines for 2,179 seats. The iron stage curtain weighs 34 tonnes and in the middle is one metre thick. The ground steel plates were created by Rudolf Hoflehner; the main curtain behind it was designed by Leo Wollner. 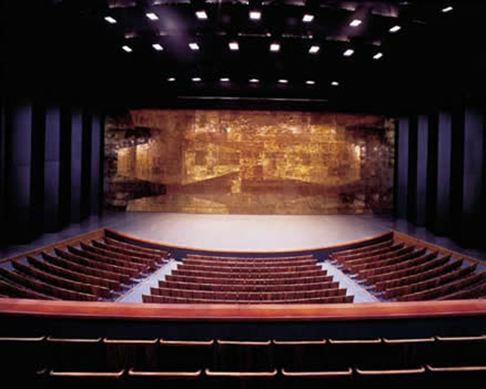 The décor for the concert hall was renewed in 1993 by Richard Peduzzi. Five bronze doors with handles designed by Toni Schneider-Manzell allow the public access from the Hofstallgasse. The façade is ornamented by a Latin inscription by the Benedictine monk Professor Thomas Michels (Order of St. Benedict):Sacra camenae domus concitis carmine patet quo nos attonitos numen ad auras ferat (The holy house of the muse is open for lovers of the arts, may divine power inspire us and raise us to the heights). Mostly local materials were used for fitting out the Grosses Festspielhaus: the reinforced concrete columns in the entrance foyer were covered with the conglomerate rock removed from the wall of the Mönchsberg; the floor is made of Adnet marble. Low beam lighting in the sloping ceiling and panel dishes made of glass from Murano create a solid lighting design. Two sculptures created by Wander Bertoni in Carrara marble represent music and drama. The four large-scale paintings in the form of crosses on the theme Dreams with the Wrong Solutions, which were bought by the Austrian patron of the arts and collector Karlheinz Essl and made available on loan to the Salzburg Festival, are by the New York painter and sculptor Robert Longo (1993). The interval hall adjoining the entrance foyer is largely based on the original ground plan of the archiepiscopal princely stables. The floor of green serpentine is new and contains mosaics of horses by Kurt Fischer. On the wall is a steel relief by Rudolf Hochlehner entitled Homage to Anton von Webern. Through the arch built by Fischer von Erlach one can look out onto the horse statue and fountain and the Schüttkasten which was acquired by the Salzburg Festival in 1987. A separate access on the left of the interval foyer leads via an escalator and steps to the underground car park for the old town centre of Salzburg. The furnishings for a Patrons’ Lounge on the first floor of the Grosses Festspielhaus were financed by the American patrons of the arts Donald and Jeanne Kahn, who later became major sponsors of the Salzburg Festival. Since 1995 it has served as a reception area for patrons, sponsors as well as their guests and is also used for press conferences and various other functions in connection with the Salzburg Festival. Electroacoustics: sound control board with 16 inputs, 16 main outputs and 4 auxiliary outputs; sockets for loudspeakers and microphones throughout the entire stage and auditorium.